INDIVIDUAL SHEETS are 20½ x 20½" square. Sold as individual sheets or packs of 10 sheets and 100 sheets. 13" ROUND SHEETS are perfect for smaller kiln shelves. Easy to trim to fit. Sold as individual sheets or packs of 10 sheets and 100 sheets. CRAFT ROLLS are 20½" wide and 82 ft long. Cut off just what you need - lots less waste than individual sheets. Roll is neatly packaged in a space saving box. STUDIO ROLLS are 41" wide and 33 ft long. You get the benefit of a full width roll (especially handy if you have larger shelves to cover). COMMERCIAL ROLLS are 41" wide and 250ft long. This is the most economical choice for heavy users. 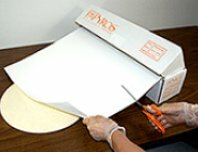 NEED MORE INFORMATION ON USING PAPYROS KILN PAPER? Safe handling tips and MSDS sheets. 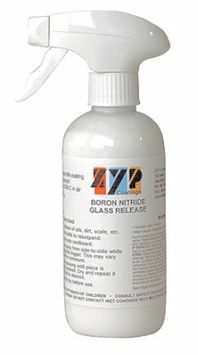 ZYP Boron Nitride Glass Release 12 oz Bottle (#02652) is a water based Boron Nitride spray that was developed specifically for the Art Glass Industry. No flammable propellants, no pressurized can. This product can ship via Air, Ground and Priority Mail to all 50 states and foreign destinations. This version of ZYP takes a bit longer to dry than the solvent based aerosol version above. Stephanie at Creative Paradise has used this version of ZYP on a variety of different molds, all with fine results. She has also used the spray version over an aerosol coating with no problems at all. Special Note: Be sure to shake well. When done coating your molds, remove the sprayer and run clean water through to avoid clogging the nozzle. ZYP Boron Nitride Aerosol Lubricoat 13 oz Can (#02651) is a fast drying Boron Nitride spray. Since this is a pressurized product using a flammable propellant, this must ship via UPS Ground to the lower 48 states. This is a premium product that has developed a very faithful following. ZYP is the recommended release for Colour de Verre frit casting molds. Can be shipped via UPS ground to lower 48 states only. Sorry, no shipments via USPS or to foreign destinations. BORON NITRIDE SPRAY MOLD RELEASE FOR GLASS CASTING AND SLUMPING is a hexagonal form of Boron Nitride in a special aerosol formulation for stainless steel and ceramic molds. Hexagonal Boron Nitride has been used in heavy industry for decades to provide a slippery surface for molds for glass and molten metals. This form of Boron Nitride works at temperatures up to 1800°F. Shake can well and on stainless steel molds, apply a light coat, wait 15 minutes and apply a second coat. Allow to dry for 15 minutes and you're ready to go. No need to preheat the mold. On new ceramic molds, apply 2-4 light coats about 5 to 10 minutes apart. Allow to dry 15 minutes and you're ready to go. On molds previously treated with kiln wash, remove as much kiln wash as possible before spraying. If firing to 1350°F, you should be able to get a couple of firings before a light recoat is needed. If firing higher, it is best to give a quick spray before the next run. As with all Boron Nitride products, once you start using Boron on a mold, you cannot go back to using kiln wash.
Must go UPS Ground to lower 48 states only. No mail or air or foreign shipments possible. HOT LINE SHELF PRIMER keeps glass from sticking to kiln shelf. When first applied, Use Haik Brush for even application. 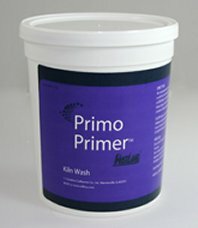 Shelf primer is also known as Kiln Wash. 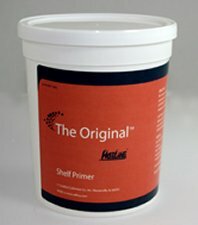 This is our best selling shelf primer. Sold as a "dry quart" which weighs about 1½ lbs and makes five quarts of liquid primer =or= in a five pound tub. PRIMO PRIMER is a major step forward in shelf primer. Goes on easy and does a great job to temperatures of 1550 to 1600°F. When you're done, just wipe spent primer with a damp sponge. No scraping needed. Used for getting a silky smooth surface. Also used for open face mold casting as it allows even fine detail to show without letting the glass stick to the mold. Goes on purple, fires to white. Sold in 1.5 lb and 5 lb plastic tubs. 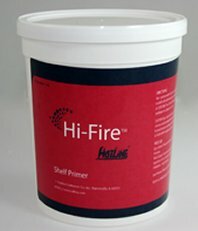 HIGH FIRE SHELF PRIMER is used when you take your kiln up higher than normal, such as when you rake your glass (1700°+F). Also perfect for coating your mandrel when making glass beads. WASH AWAY is the best stuff to remove shelf primer/kiln wash from the bottom of your fused pieces. Use full strength. Apply to the offending spot of kiln wash and lightly scrub with a plastic scouring pad. Works great! Must go UPS Ground to lower 48 states only. No mail or air or foreign shipments possible. FABRICUT is used to remove used shelf primer from shelves and molds. Fabricut is a silicon carbide impregnated open weave cloth that effectively removes shelf primer without clogging up. Much more efficient than sand paper and will not gouge the kiln shelf surface like a scraper blade might. Long lasting! Made in USA. HAIK BRUSH (also known as "hake brush", pronounced "ha-KAY) is used for applying shelf primer to molds and kiln shelves. Long, soft bristles hold a lot of primer and flex easily to apply evenly. Two sizes are available. Use the 2-3/4" wide brush to coat molds and smaller shelves; use the 5½" wide brush for larger shelves.